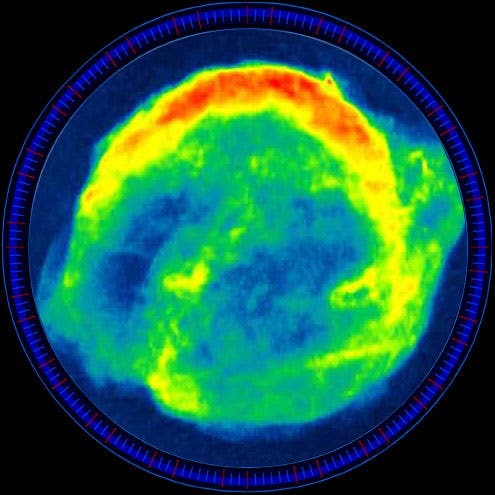 This radio image of SN1604, the Kepler Supernova, shows a spiral region of emission extending along the top of the expanding elements. 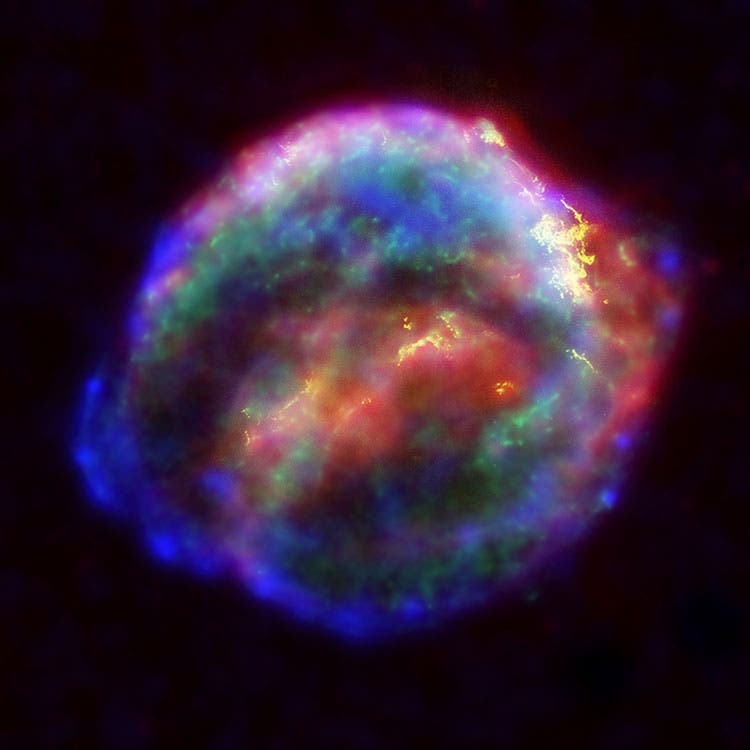 Light from this supernova reached Earth in 1604. Bright as Mars when first observed,it surpassed Jupiter in brilliance within a few days. The Kepler Supernova remnant was a supernova which occurred in the Milky Way, in the constellation Ophiuchus. It is the last supernova to have been unquestionably observed in our own galaxy, occurring no farther than 20,000 light-years from Earth. Most astronomers today believe that one of the most plausible reasons we have yet to detect intelligent life in the universe is due to the deadly effects of local supernova explosions that wipe out all life in a given region of a galaxy. While there is, on average, only one supernova per galaxy per century, there is something on the order of 100 billion galaxies in the observable Universe. Taking 10 billion years for the age of the Universe (it's actually 13.7 billion, but stars didn't form for the first few hundred million), Dr. Richard Mushotzky of the NASA Goddard Space Flight Center, derived a figure of 1 billion supernovae per year, or 30 supernovae per second in the observable Universe! *Certain rare stars -real killers -type 11 stars, are core-collapse hypernova that generate deadly gamma ray bursts (GRBs). These long burst objects release 1000 times the non-neutrino energy release of an ordinary "core-collapse" supernova. Concrete proof of the core-collapse GRB model came in 2003. It was made possible in part to a fortuitously "nearby" burst whose location was distributed to astronomers by the Gamma-ray Burst Coordinates Network (GCN). On March 29, 2003, a burst went off close enough that the follow-up observations were decisive in solving the gamma-ray burst mystery. The optical spectrum of the afterglow was nearly identical to that of supernova SN1998bw. In addition, observations from x-ray satellites showed the same characteristic signature of "shocked" and "heated" oxygen that's also present in supernovae. Thus, astronomers were able to determine the "afterglow" light of a relatively close gamma-ray burst (located "just" 2 billion light years away) resembled a supernova. It isn't known if every hypernova is associated with a GRB. However, astronomers estimate only about one out of 100,000 supernovae produce a hypernova. This works out to about one gamma-ray burst per day, which is in fact what is observed. What is almost certain is that the core of the star involved in a given hypernova is massive enough to collapse into a black hole (rather than a neutron star). So every GRB detected is also the "birth cry" of a new black hole.